The words “beautiful” and “war film” usually don’t go together in the same sentence unless you’re describing one that borders on romance. War films are generally more about history, heroism, and lots of explosions and men being seriously wounded, so it’s a breath of fresh air when a new film can maintain the best elements from the genre yet present something visually stunning at the same time. Winter in Wartime fuses the war film with a new age of filmmaking – other films which did this include Atonement and Inglorious Basterds – and puts a spin on the traditional codes and conventions of the genre. What comes out is a unique and poignant film that strikes a chord with even the hardest of hearts, and opens up a new cinematic experience for anyone who watches it. Let’s be honest here: the WWII Nazi storyline has been overdone, and it really is hard for directors to create films about war which aren’t just the same old, same old. 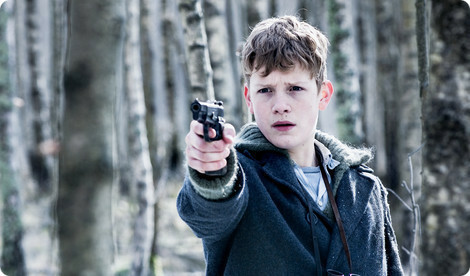 Winter in Wartime is one part war film, one part arthouse, and one part coming-of-age, which makes for an interesting blend of cinema that captured my attention straight from the beginning. The year is 1945, and Michiel is a 14-year-old boy living in Nazi-occupied Holland with his family and his Uncle Ben, who has come to stay in difficult times. When his next door neighbour Dirk gets arrested for trying to assist in the Resistance, Michiel is tasked with delivering a letter from Dirk outlining the hiding place for a crashed RAF pilot. However, the man who he was supposed to deliver it to is killed by German troops, and Michiel takes it upon himself to assist the injured pilot, Jack, in escaping to a safe part of the Netherlands. What Michiel doesn’t know, though, is that trying to save the pilot will turn into far more than just his own plight for heroism, and the cost is greater than anything he could have imagined. The plot for Winter in Wartime is – like I mentioned – one part coming-of-age, and of all the aspects in the story this is what stood out to me as the most striking and unique. 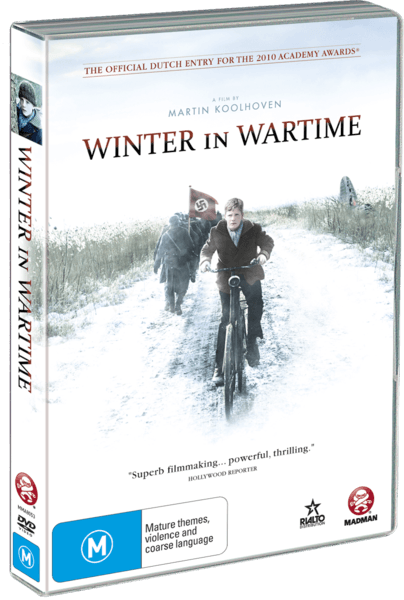 Any person who remembers their childhood days of watching movies and reading books will remember how exciting and glamorous being the hero of the story seemed; Winter in Wartime exposes us to the reality of being the ‘hero’. The film refuses to glorify war, but at the same time Koolhoven also exposes the beauty of humanity in the toughest of times: Michiel’s story is the perfect example of how kindness can go a long way in such extenuating circumstances. With all that being said, it’s not a film without a bit of action and mind-twisting, and the one thing which did let the film down was a slightly predictable overarching story. While the film itself was gripping, suspenseful, poignant and dramatic, the ‘big plot twist’ left a lot to be desired. So often in cinema these days, directors and screenwriters put too much attention on generating a plot twist which attempts to surprise their audience, and eventually the taste becomes stale and unpredictability becomes predictable. While the story wouldn’t be what it is without the twist (of course, I’m not going to ruin it but you’ll probably guess it from the start like I did), it dulled the shine slightly on an otherwise beautiful storyline. The other resonating feature of this film is how much it rings true to its time period: there are Dutch characters, British characters, and German characters which provides for an eclectic mix and a unique portrayal of the war. The film’s characters are both relatable and extraordinary at the same time, and it’s safe to say that they make the story what it is. While it’s all well and good to have a touching storyline, what truly captivates any audience and makes a film stand out are the characters who tell the tale. First things first: I absolutely loved Michiel and I think he made the film go from good to great. There is a childish naivety to him which captures the youthful side of all of us; yet at the same time he is far stronger and more inspiring as a person than his fourteen years give him credit for. His desire to be a hero and to do good reminds us that he is just a teenage boy caught in an adult world. Koolhoven stresses through Michiel’s character that the effects of war reach even the youngest of people, but it is in times of war that the true side of humanity is shown. Speaking of the true side of humanity, Koolhoven’s portrayal of the Germans was refreshing and realistic as well, and it makes the film stand out that much more. There is a tendency in WWII films to glorify the victors (the winners get to write the story, after all) and show Nazi soldiers as unyielding, cold, heartless people who only torture kill. While Winter in Wartime has a few of these Nazis, the film portrays many of the German soldiers as humans who have been forced into a terrible circumstance. On more than one occasion, the Germans have helped Michiel – a German soldier saved him when he fell into a river, and when the wheel from his carriage fell off Germans helped him put it back together – and Koolhoven reminds each and every viewer that these men aren’t as bad as they’re made out to be. The rest of the characters are brilliantly portrayed, and the only one I was really indifferent about was Erica, Michiel’s younger sister. Her character was just a little too ‘blah’ (for lack of a better word to describe it) and to be frank, I had actually forgotten – on more than one occasion – that she was there. The cinematographer deserves some sort of prize or acknowledgment in this film, I swear. The composition of the shots and the overall colour tone of the film give it a beautiful touch which other war films are just lacking. 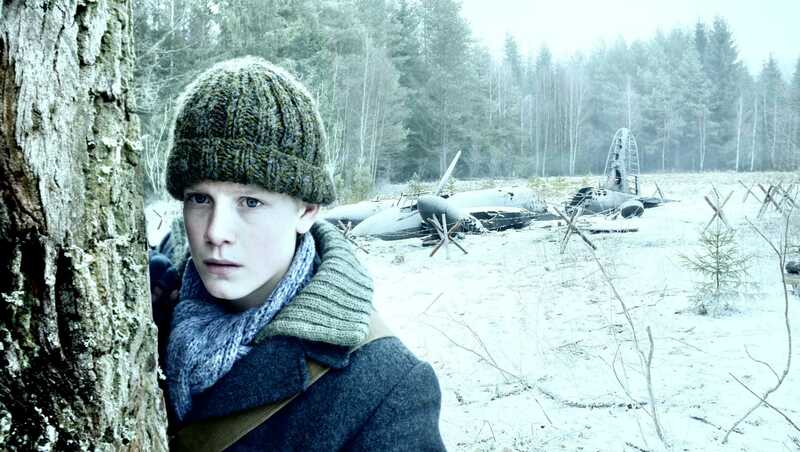 With a title like Winter in Wartime, there’s no doubt that the film was going to be shot in winter with snow, and this was most definitely a great addition which gave the film a unique touch. The snow covers a city which otherwise would be thriving, and presents a great metaphor for the ending of the war and the resurgence of a new beginning and growth within Europe. The characters’ clothing looks stunning in their contrast against the snow, and Jack, Michiel, and his father’s ice eyes will pierce you any chance they get. The special effects were also wonderfully done, although there weren’t that many explosions to showcase – the film is more about the people caught in the war rather than guns and bombs anyway. However, one of the moments where the special effects really shine is when Michiel’s father skins a rabbit and you see the skin come off and the muscles underneath exposed (sounds appetising, doesn’t it?). The standout audio feature in this film for me – aside from the soundtrack, which did great to heighten the suspense or jerk at heartstrings – was actually the mix of Dutch, German, and English. 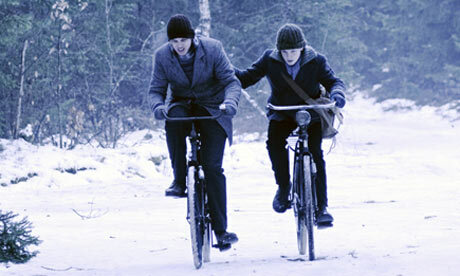 It doesn’t seem like something huge, but it really made Winter in Wartime that much more believable and realistic. The best part is when Michiel speaks to Jack in English: I could pick out a few words, but without the subtitles I really would have been absolutely lost and to be fair, I don’t know how Jack understood him. The DVD contains the theatrical trailer of the film which I had seen on Youtube already, so there wasn’t really anything ‘extra’ for me. I would have loved it if they had made a “Making of” feature to introduce the actors, as well as to show how some of the scenes were shot. Deleted scenes would have also been a good idea, because there were plenty of funny moments in the film and I’m sure there would have been a lot more that didn’t make the cut. 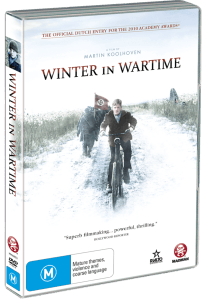 Winter in Wartime is a great war film and should be watched by war film buff, but even those who don’t like the genre can appreciate it for its genuine human portrayal. While Koolhoven may have fallen a little bit short in terms of his plot twist, the experience of watching this film was both touching and inspiring. This is definitely a new take on an old theme, and the beauty of it has left me still staring at the cover in awe…even though I finished it more than 3 hours ago.